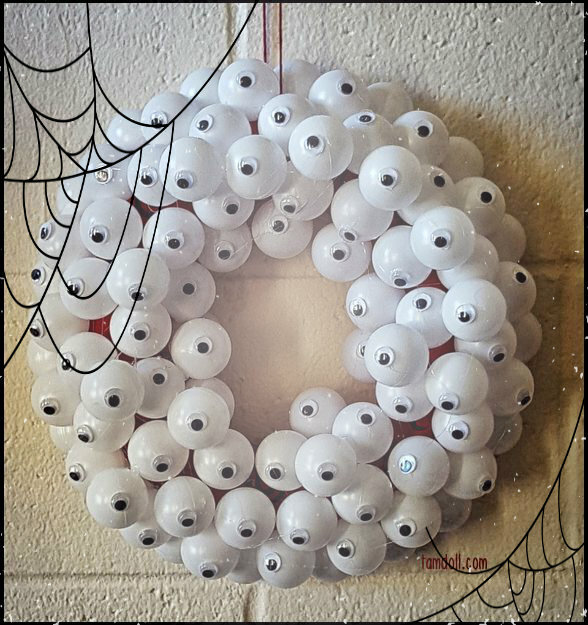 If you can hold a glue gun, you can make this Halloween wreath. 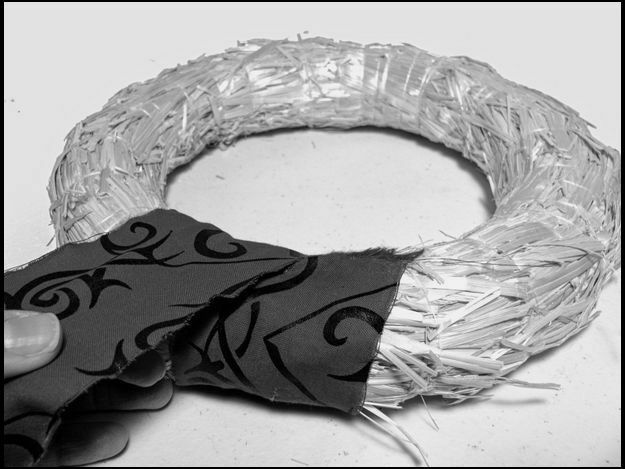 Step 1: Wrap a wreath frame in fabric. I used a 10" straw wreath & strips of fabric I ripped from a 45" long piece. I used 4 strips, and each was about 2.5" wide. Accuracy isn't very important, this base will be mostly covered up in the next step. The strips were held down with dabs of low-temp hot glue. Once it's all wrapped up, tie a string around the wreath to use for hanging. 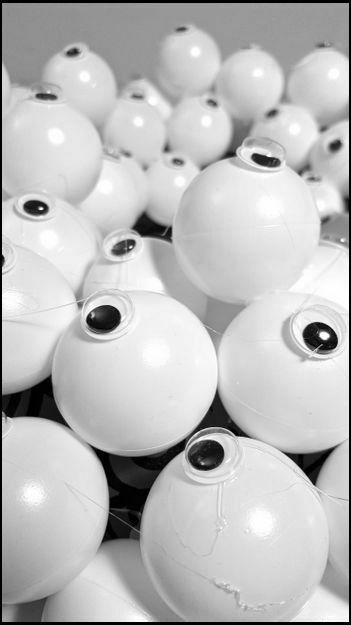 Step 2: Start gluing on balls. 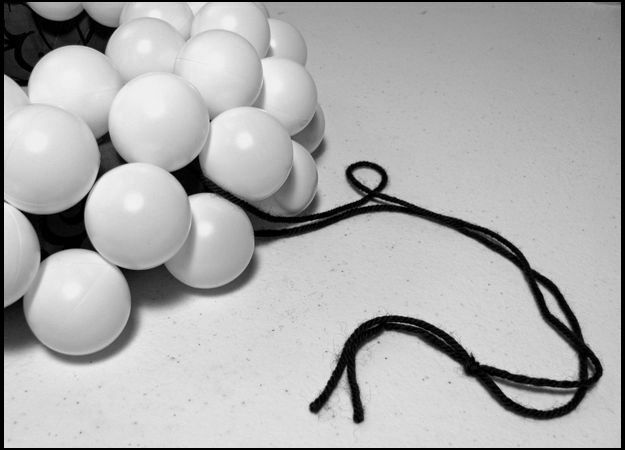 I used beer pong balls for this project because they were cheap and light-weight. 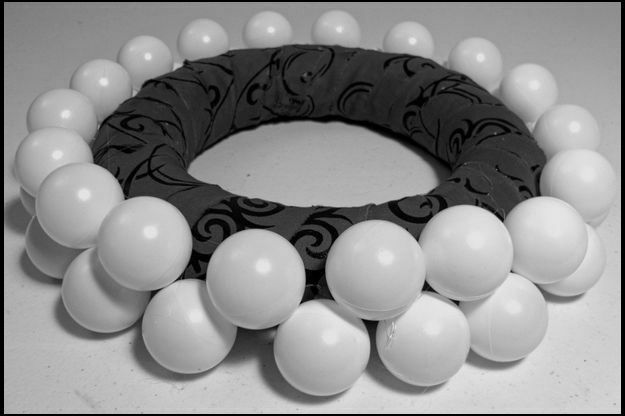 Laying the wreath on a table, and gluing the balls down as it lay flat ensured that it wouldn't jut out from the wall when it was done. Spacing and accuracy isn't very important - not taking this too seriously. Red fabric showing through? Strands of glue everywhere? = Creepy. Step 3: Keep adding rows of balls, filling in holes and spaces as you go along. 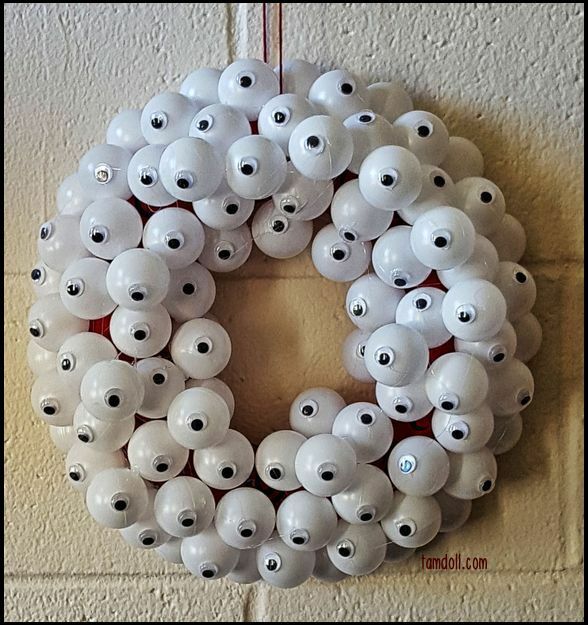 Work your way around and into the center of the wreath. Step back and look at it once in a while to cover any gaps you may want to fill. That's it. When I was all done, I thought I should have used red glue sticks... maybe next time. I have low expectations that this project will last very long hanging in a dorm room, and who knows what will happen to it after Halloween. But it was fun to do, and took less than an hour to make. Using a glue gun kept this project low-stress - everything dried within seconds of putting it in place. I often hesitate to make Halloween costumes or decorations, the event comes and goes so quickly, the effort often seems more work than it's worth. But this project was a breeze, I've already made two for my girls and have enough balls to make a third... maybe I'll be hanging one outside my door this year. Will you make decorations for Halloween?